We will be taking a young man to Sabougla Wildlife Refuge in Calhoun County this afternoon and again tomorrow afternoon. The Grenada Lake COE has graciously provided this 1000 acres for us to use and we are very thankful for their help with our journey. We also have outings planned for the first and second weekends in December. Your prayers and God's blessings are what makes these things that we do possible and we aprreciate everything that yall do to support us. Thanks again and Happy Thanksgiving to all!! Hope it is a memorable hunt for all involved ! What an awesome hunt!!!! Jordan and I settled in around 2:30 the afternoon in the Sabougla Wildlife Refuge in Calhoun County. The Grenada Lake COE has given us permission to use this 1000 acre block of river bottom that has not been hunted in some 40 years. Hot, wind blowing from the wrong direction, and swamp skeeters buzzing, it was NOT the perfect afternoon for a hunt but a bad day hunting beats the heck out of a day at work. Especially when you get to share it with someone. We had heard alot of squirrels but had not see hide nor hair of anything, getting close to 5 O'clock I told him that we had another day so if we didn't see anything we would get em tomorrow. It is amazing how quickly a hunt can turn around. Shortly after 5 I said, "DEER". Straight in front of us about 50 yards were two coming across in front of us and Jordan scoped out the bigger of the two and shot. She hit the ground and never moved!!! Awesome shot dude!! Expecting deer to fly out of there we were both amazed as the dead doe was joined by a spike and then four more deer walking around looking at her. The Primos blind worked well as all six were within 30 yards of us and one even got as close as 10 yards at one point. We waited until shooting time was up hoping to get a look at a buck but that wasn't in the cards this evening. Awesome afternoon is all I can say!!! Thanks to all of yall for your support and prayers that made this possible. Also, thanks the Mr Gober, head of the Grenada Lake COE, and Damon Blakely, parker ranger, for helping us get this together and allowing us access to the property. Last but not least thanks to the Lord above for putting Jordan and I together to share an awesome afternoon!! 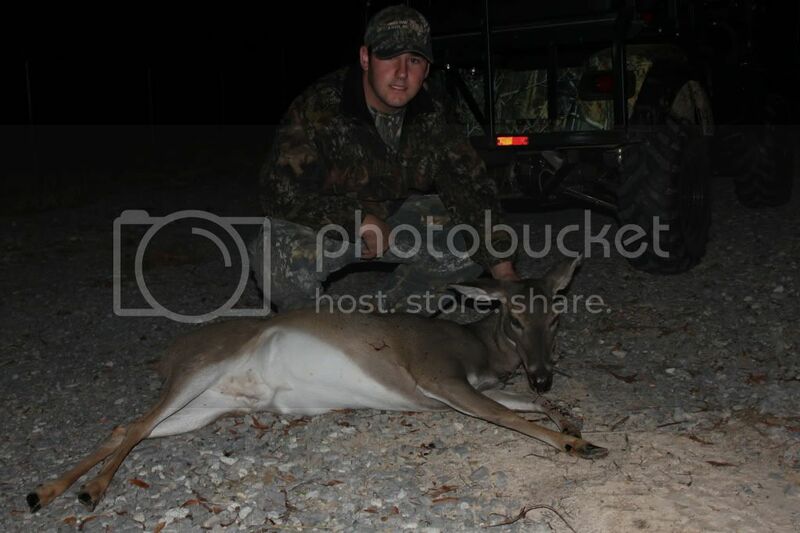 Didn't see no piggys but we got him an ole skillet head!!!! Maybe we can get him a piggy or a buck tomorrow evening!! CONGRATS TO YALL!!!!!! and GOOD LUCK on getting that buck!!! BIG BUCK! Congratulations on the doe! Hope you can see some good bucks tomorrow. Thanks for what you guys do at A Hunt Above! Thanks guys!!! Headed back this afternoon, raining here now but think it will be through here by noon. Gonna be looking for piggys too!!! We are back in the blind looki.g for another one, maybe we can get another one this afternoon.